Home Secretary Theresa May has ordered officials to issue Chinese artist Ai Weiwei a full six-month UK visa, reversing a decision not to grant him the travel document. The Home Office confirmed its decision following an earlier statement the home secretary was "looking into" the case. The six-month visa was initially refused as the artist was accused of lying on his application form. Home secretary Theresa May has also apologised to the artist. Earlier this week, Ai posted a letter on Instagram stating his entry to the UK had been restricted to a 20-day visa. Ai said he had been told he had failed to declare his "criminal conviction", however although he was detained in China for 81 days in 2011, he has never been charged or convicted of a crime in China. The artist is travelling to London for a landmark exhibition of his work at the Royal Academy of Arts, after Chinese authorities granted him a passport. A spokesperson for the Home Office said a letter had been sent to Ai "apologising for the inconvenience caused". They added: "The Home Secretary was not consulted over the decision to grant Mr Ai a one-month visa. She has reviewed the case and has now instructed Home Office officials to issue a full six-month visa." A statement from Royal Academy of Arts chief executive, Charles Saumarez Smith said: 'The Royal Academy of Arts very much welcomes news that the Home Office has now decided to grant Ai Weiwei the normal 6-month business visa he originally applied for. "We look forward to welcoming him at the Royal Academy for the opening of his major exhibition in September." Ai's passport was confiscated when he was arrested in 2011 during a government crackdown on political activists. He was held over alleged crimes of bigamy and tax evasion, but was released without charge. Ai was fined 15m yuan ($2.4m, £1.55m) for tax evasion in a civil case in 2012. The artist lost an appeal against the fine - which he maintains was politically motivated in retaliation for his criticism of the Chinese government. In a separate post on Instagram, Ai stated he "has never been charged or convicted of a crime" and had "attempted to clarify this claim with the UK Visas and Immigration Department and the British Embassy in Beijing over several telephone conversations". "But the representatives insisted on the accuracy of their sources and refused to admit any misjudgement. 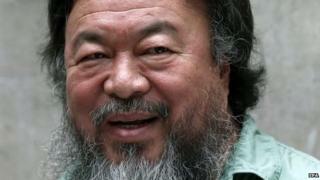 This decision is a denial of Ai Weiwei's rights as an ordinary citizen," he added.